Whenever I pass a roadside diner promising something like “world’s best cherry pie,” I think about lawyer advertising restrictions. Because no law firm or lawyer could tout themselves as the best or greatest—and many of the taglines, phrases and symbols used to market products and services to consumers are restricted or outright prohibited in the legal profession. Of course, I’m a sucker for that cherry pie. And it never is remotely close to the best I’ve ever had, but I also know the difference between a marketing message and stark reality. 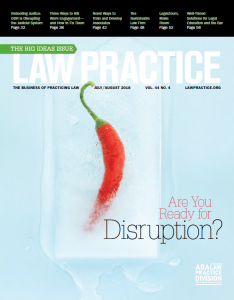 Which all somehow leads into the topic of my marketing column in the July/August 2018 issue of the ABA’s Law Practice Magazine, Law Marketing Model Rule Revisions – Better Late than Never? It remains to be seen what will actually happen to the proposed model rule changes to law marketing and advertising when it gets to the ABA House of Delegates in August. After all, it is a long way from the ABA Standing Committee on Ethics and Professional Responsibility (which arrived via multiple reports starting in 2015 from the Association of Professional Responsibility Lawyers—APRL) to the House floor. The debates at the ABA Midyear Meeting in Vancouver this past February volleyed back and forth between those that thought the suggested revisions went too far, and others who firmly believed they did not go far enough. Of course, once something is approved—state bars often like to remind us that they are nothing more than “model” rules, and that the states will decide themselves what direction lawyer advertising should go in down the pike. I myself sit on the Ethics & Professionalism committee of the ABA Law Practice Division, where we often are looking at the ethics rules as they apply to law practice, in the realm of management, finance, technology and marketing. There is always just something that feels different when it comes to marketing—that inherent discomfort that goes with realizing we have to toot our own horns, tout our successes, and compete in a finite marketplace—yet want to remain “dignified” and above the fray when doing so. But if you are a business—your market—if you are interested in sticking around. For me, the reality is the tumult that goes with the marketing/ethics conversation has been critical to my own business development and success. I’ve literally written and spoken on the subject hundreds of times since the late 90s. You would think it would get old or boring, but while states have continually played catch-up to updating the rules (and enforcement), entrepreneurial attorneys and new technologies have kept the needle moving constantly. It never gets boring, and it never gets old, because it is never the same. I once would talk about the Yellow Pages—not so much anymore. I’m more likely to be looking at issues relating to geo-fencing on Google, Facebook advertising or determining when a tweet is an ad, or…just a tweet, I guess. Of course, adoption of new rules will be very good for business—another article to write, another CLE to teach, different states taking different stances. We’ll see if change in the form of modernization is indeed coming soon.